The song begins in Burr's perspective. 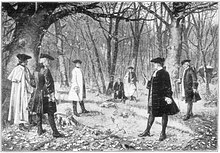 Burr states ten facts about the duel as a reprise of "Ten Duel Commandments" plays, noting that the duel is taking place in the same spot where Hamilton's son was killed in a duel. He shoots Hamilton as Hamilton throws away his shot by aiming at the sky. As the bullet approaches him, Hamilton breaks into a soliloquy, wondering if his death will be his legacy and mentioning some of his deceased friends who await him "on the other side" before dying. Burr then discusses the aftermath of the duel, as he was ushered away from his opponent and retreated to a bar for a drink. He laments on how he is now considered a villain in Hamilton's history rather than being appraised on his own achievements, and informs the audience that Hamilton died in the company of his wife Eliza and her sister Angelica. He then regretfully states that he should have "known the world was wide enough for both Hamilton and me". The song takes its title and inspiration from a quote by Burr: "Had I read Sterne more and Voltaire less, I should have known the world was wide enough for both Hamilton and me". It features reprises and leitmotifs from multiple other songs in the musical, including "My Shot", "The Story of Tonight", "Wait for It", "Ten Duel Commandments" and "One Last Time". It also marks the last time in which Hamilton speaks on stage. The song features a variety of musical styles, from the fast-paced and frenetic beginning to the slow, poetic ponderings of Hamilton prior to his death. The Young Folks had it ranked as the 16th best song in the musical. Huffington Post praised the "poignant rumination on death and legacy", and said that the song was effective as it makes Burr complex and real, rather than a mere villain. Democratic Presidential Candidate and former Secretary of State Hillary Clinton quoted from the song at the DNC during her 2016 Presidential Campaign, saying "Let our legacy be about 'planting seeds in a garden you never get to see'", a reference to Hamilton's soliloquy. Lin-Manuel Miranda responded positively on Twitter, stating "I'm with her". ^ "Aaron Burr: "Had I read Sterne more and Voltaire less, (I might not have dueled & killed Hamilton)"". DemocraticUnderground.com. ^ "Every Song from 'Hamilton,' Ranked - The Young Folks". www.theyoungfolks.com. ^ Logan, Elizabeth (1 October 2015). "I Have an Opinion on Every Song in "Hamilton"". ^ Rosenberg, Alyssa; Rosenberg, Alyssa (9 November 2016). "From 'Parks and Recreation' to 'Hamilton,' pop culture turned from promise to elegy" – via washingtonpost.com. ^ "Hillary Clinton Quotes Hamilton in DNC Acceptance Speech - Playbill". Playbill. ^ Miranda, Lin-Manuel [@Lin_Manuel] (July 28, 2016). "I'm with her. #AndShesBeenListeningToDiscTwo!" (Tweet) – via Twitter.